Although some creatures have intricate greeting rituals, others will defend themselves violently at the first sign of danger. Unless 2 Diplomacy and INTEGRITY>32 OR Empathy and INTEGRITY>35 present, all undocked ships at this location are damaged and relocated one location toward far end of spaceline. 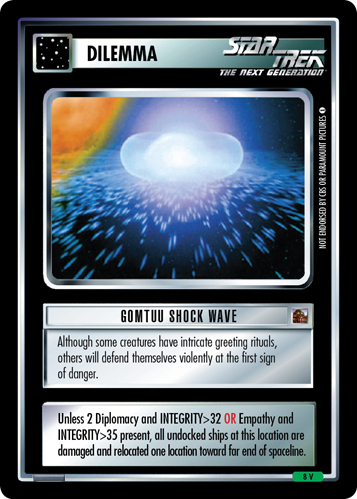 If you play OTF this card replaces the backward compatible 2E card Gomtuu Shock Wave from Call To Arms - ST1E compatible (the 2E card is no longer valide in OTF).